Now it is huge and covered with flowers from whence comes that glorious smell that takes me back to my Granny Nicholson's porch in South Carolina, and that is a place I love to revisit in my mind. I can't say that the distinctive smell of this flower always brings with it lots of different memories of my Grandmother or her house in Mullins, SC or the family times we spent there. 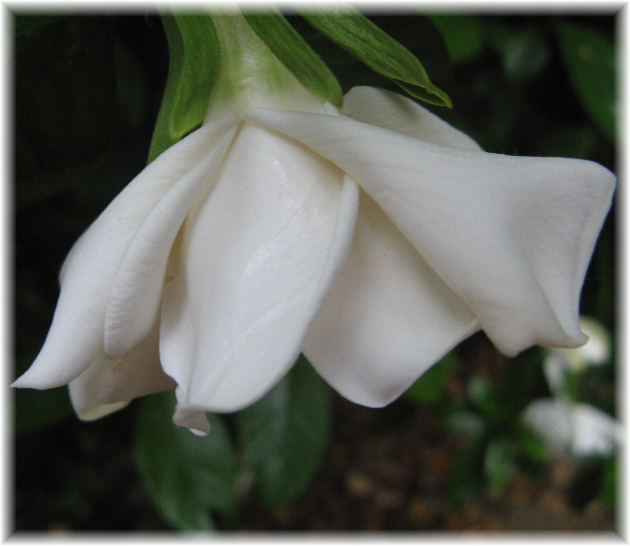 On the other hand, I cannot smell the gardenia without thinking of that particular porch. The gardenia - both shrub and flower - is a touchstone for me. In NLP [Neuro-Linguistic Programming] it might be called an "anchor" - something that triggers a memory every time it is experienced. Like hearing an old song and remembering where you were and who you were with and how you felt the first time you heard it. The blooms this year are just about spent - only a few remain. Then I'll have to wait until next June to enjoy that lovely fragrance again. I sure wish my gardenia could bloom all year long.